These days, when you ask your kids to entertain themselves, most of them will think of using either a video game console (portable or otherwise), smartphone or the computer. How about a good old fashioned run about in the garden that makes them sweat in places other than their palms? That’s what the £17.99 Djubi intends to do, overhauling the age-old game of throw and catch. After all, with a jazzy new name like this, how else are you going to say no? You can place a pre-order with Firebox, and that ought to secure you a couple of space-age looking racquets that will function as both launchers and catchers. The elastic strap of the Djubi (or ball, depending on how you want to call it) will hook over a strategically-placed notch on the raquet. Pull it back and watch it fly to an astounding 100ft. 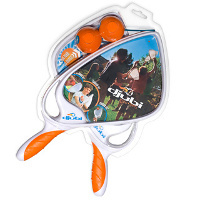 Once the Djubi takes to the air, it is your opponent’s job to catch it safely in the net of their raquet, followed by a return action towards you. Just don’t send it flying into your neighbor’s windows, all right?